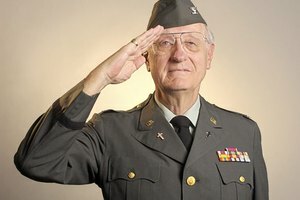 Military personnel are trained to take pride in their physical appearance. Care and maintenance of uniforms is part of the job. In the United States Navy Uniform Regulations Manual members of the Navy are directed to “present a proud and professional appearance that will reflect positively on the individual, the Navy, and the United States.” Properly wearing awards and decorations at the appropriate time is an important component of proudly wearing the Navy uniform. Medals are traditionally worn on formal or dress uniforms and the Navy has three categories: service, full and dinner dress. Service uniforms use ribbon bars and are worn for official business that is not formal enough to require full or dinner dress uniforms. Full size medals are worn on the service coat of the full dress white uniform and the full dress blue uniform. Full dress uniforms are recommended for wear at various ceremonies: weddings, funerals, retirement and commissioning ceremonies or changes of command would all be appropriate occasions. Miniature medals can be worn on dinner dress uniforms. Dinner dress uniforms are the military equivalent of black tie. Before affixing the medals to your uniform check that they are in good condition. The material of the ribbons should be crisp, clean and without frayed edges. Ensure that all appurtenances such as stars, oak leaf clusters or numerals are attached as necessary and in the proscribed manner. Pins should be straight, in good condition and have their backs so the medals don’t fall off while being worn. Be sure to establish the order of precedence before mounting the medals on your uniform. The two basic types of medals are decorations and service medals. Decorations are bestowed for bravery, valor or merit. They can often be distinguished by the shape of the medal itself, be it a star, cross or geometric shape. 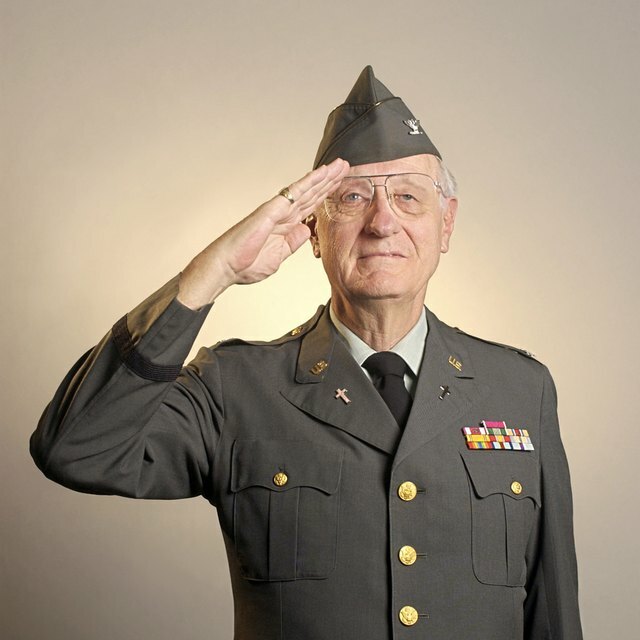 Service medals are earned for participation in a campaign and the medals are usually round. The general order to be followed is: distinguished and meritorious service awards, achievement and commendation medals, and unit awards. The Navy and Marine Corps Awards Manual (SECNAVINST 1650.1F) provides a complete order of precedence for all medals authorized for wear on the Navy uniform. Once you have decided which medals to wear and their order of precedence, you are ready to affix them to the uniform. Chapter 5 section 3-14 of the uniform regulations manual states that the medals should be arranged “in order of precedence in rows from top down, inboard to outboard, within rows. 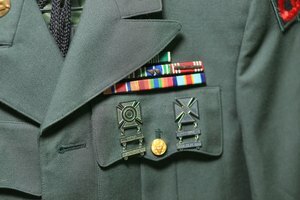 Service members possessing more than five medals may either wear the five senior medals or all of them.” If more than one medal is going to be worn they can be suspended from a holding bar that will bear the medals’ weight better than the fabric. Medals should be arranged over the left breast pocket to be centered and not obscured by the coat lapel. Five medals is the maximum amount that can be worn side by side. 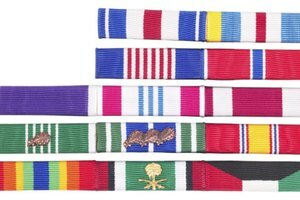 Multiple rows of medals may be grouped with the same number of medals, any grouping of fewer medals than the other rows should be worn on top. Any medal grouping more than three should be overlapped. 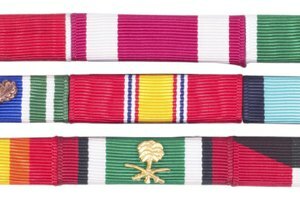 Service ribbons that do not have corresponding medals can be worn on the right breast of the uniform and should be aligned with the holding bar of the lowest row of medals on the left. Based in Texas, Suzanne Paulo has been writing for over 15 years. Her work has appeared in such publications as "Catholic Digest," "Guide," "Pockets," "Fun For Kidz" and "Boys' Quest." She holds a Bachelor of Arts in business administration from Washington State University. Paulo, Suzanne. 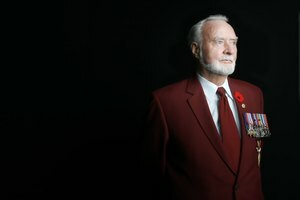 "Proper Wearing of Navy Medals." Synonym, https://classroom.synonym.com/proper-wearing-of-navy-medals-13583877.html. 25 June 2018.